How is my product performing in the recommendation boxes? Curious to see how individual products perform? Here's how to check. Your products will load by default by Revenue Generated. Search for a specific product using the search icon. 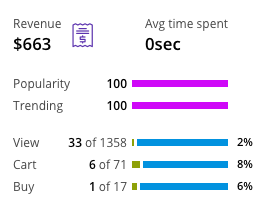 Click on the product you'd like to view analytics for. All of the products will have a basic information on number of views, add to carts and purchases generated by Personalizer. 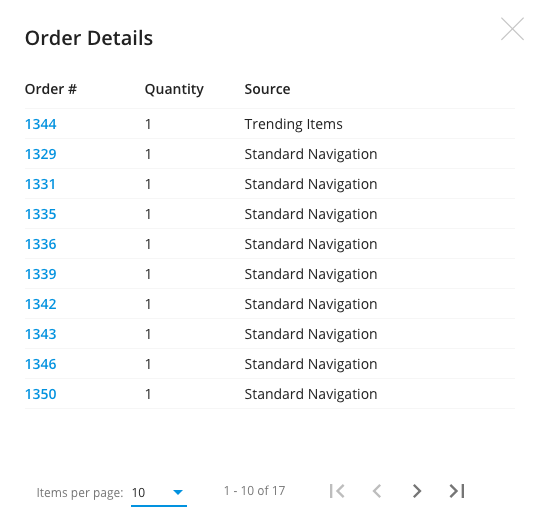 Clicking on the receipt icon shows a list of the order #'s and whether the product was driven by LimeSpot's recommendation box or Standard Navigation. Clicking on the detailed popup card will show you details about conversions generated from each recommendation box.